Introduction:The armature wedge inserting machine will finish the work such as the rotor lifting, clamping, shaping of the insulating wedge paper, cutting and inserting automatically, and is of high reliability to be under the control of PLC. 1.The rotor wedge inserting machine is of high reliability to be under the control of PLC. 2.The electromechanical linkage device and the faults detection system is mounted. 3.Pneumatic work piece clamping automatically. 4.The English operation system is available. 5.The rotor wedge inserting machine is easy to change the tooling. 6.The rotor wedge inserting machine body is light and elaborating. 7.If only the rotor to be processed is placed on the feeding track, the wedge inserting machine will finish the work such as the rotor lifting, clamping, shaping of the insulating wedge paper, cutting and inserting automatically. This armature wedge inserting embedded machine is suitable for home appliance, car motor, and power tooling motor armature. Motor armature / rotor manufacturing production assembly line including: shaft pressing machine, end cover pressing machine, commutator pressing machine, armature insulation paper inserting machine, armature winding machine, commutator hot stacking machine, armature wedge inserting machine and armature testing machine, ball bearing inserting machine, and worm shaft inserting, NIDE can supply and manufacture about then ,and all the process will be done by machine automatically. Operator only needs to do loading and unloading. 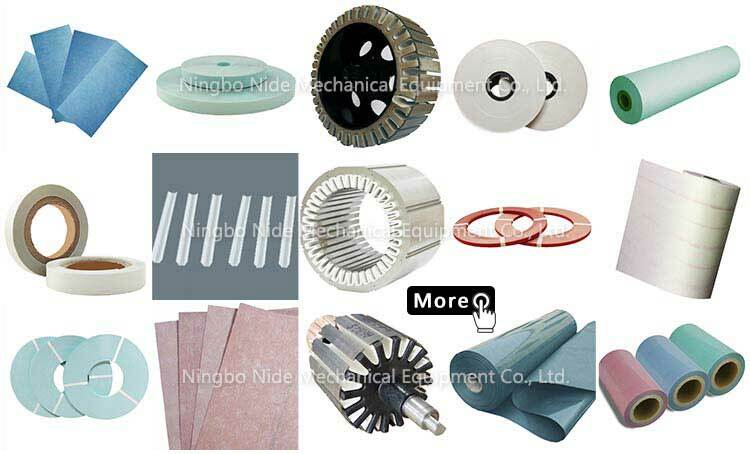 Nide is to provide different kinds of motor manufacturing machinery, including stand along machine, fully-auto complete line for armature and stator production, and the motor assembly line.We can supply the full range of motor components such as commutator, ball bearing, carbon brush, insulation paper, shaft, magnet, fan, motor cover,etc.We also provide technical support and consulting, project support and turn-key service for some motor manufacturing. Our machines are mainly applied to induction motors, BLDC motor, universal motor, three phase motor, single phase motor, AC motor, DC motor, such as washing machine motor, air conditioner motor, pump motor, cooler motor, alternator motor, fan motor, ceiling fan motor, compressor motor, power tool motor, vacuum cleaner motor, mixer motor, series motor, electrical car motor, wheel hub motor, electric toothbrush motor, hair dryer motor, electric shaver motor,etc.